The Syracuse University Pride basket was created for the students and alumni of SU. 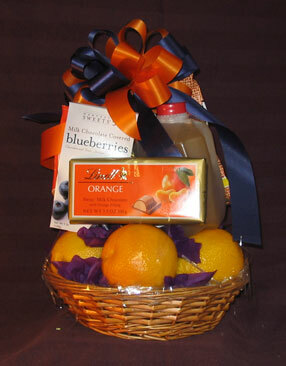 This basket features 10-12 pieces of Extra Fancy US #1 fruit (mainly citrus), fresh NY State apple cider (depending on season), Lindt Orange Creme chocolate and gourmet chocolate covered blueberries. The basket is wrapped tightly and topped off with a special handmade Orange and Blue bow. Hoorah for SU. Makes a great gift for any occasion... especially for finals week!